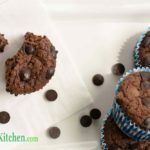 Keto Chocolate Muffins Recipe - "Double The CHOC" - Moist & Sweet! We couldn’t stop at just at just Choc Chip we wanted more Chocolate. So here's our keto chocolate muffins recipe - DOUBLE the CHOC. In a bowl, combine almond flour, cocoa powder, erythritol and baking powder. Add the vanilla extract, eggs, and heavy cream. Mix well. Add the melted butter and combine. Add the sugar-free chocolate chips and stir well. Spoon the mixture into 12 holes of a standard muffin tray that has been lined with cupcake papers. Bake for 20 minutes, the muffins will look puffed up and slightly spring back when touched. 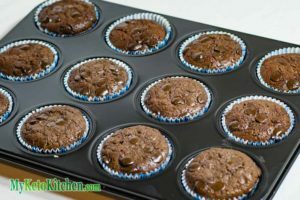 Allow to cool in the muffin tin, or eat them straight away – beware of the molten chocolate chips. The muffins will shrink back a little as they cool.